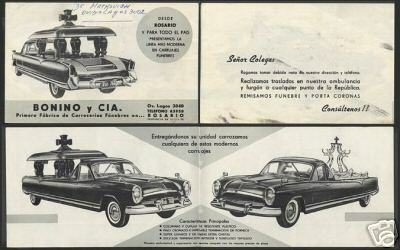 Argentine Kaiser Carabela, see image of this rare Argentine Kaiser Carabela 2 door.For more information: Email: Bob Frassinetti. Press here to go back to web blog:Daily Updates on Art, Antiques, Collectibles as well as travel information for Buenos Aires, Argentina. 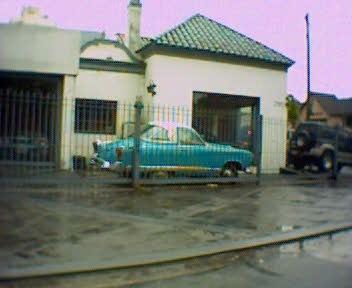 Old Cars and Old Tractors found in Uruguay ........... Rally CAR for art Dealer. The main idea in our minds these days, that’s been guiding a great part of our daily work in the research needed to buy an Antique car. We are working on buying a magnificent vintage old car, one, that will be sufficiently old and flexible to join the ever growing number of rallies taking place here in South America, especially in Argentina, Uruguay and Chile. We focus in the southernmost region of the American Continent due to the natural facilities we enjoy from our privileged location. Art Dealer is a cultural company based in Buenos Aires, Argentina, well placed geographically we find ourselves with the advantage of being able to send to any region within Argentina and it’s neighbouring countries any vehicle at any time to the rallies we will be participating in. Even more convenient is our location taking into account the number of Rallies that take place in the Buenos Aires area and its surroundings. For more information: Email: Bob Frassinetti. Press here to go back to web blog:Daily Updates on Art, Antiques, Collectibles as well as travel information for Buenos Aires, Argentina. Our project works in many ways similar to a Shared Time property, in stead of real estate, an antique car that as we go growing we will go broadening the options of vehicles too. Pilots, mechanics, families as whole, art and antique lovers, international sponsors, international companies who wish to offer their management staff a sophisticated top notch bonus like gift and every one who has a passion for these activities and cars are welcome to take part. But as every one of our projects, we offer alternatives not just for the passionate about antiques, art and collectibles but to all the other members of the family, friends and co workers who don’t enjoy as much as they do the world of antiques. Hence we include our customized touring services, personal shopper staff and bon vivant service options. options We encourage rally drivers –experienced and amateurs- from any part of the world who are interested in participating to please feel free to email us for more information. And keep this page posted in your favourite section, for we’re soon to include more details! For more information: Email: Bob Frassinetti. Press here to go back to web blog:Daily Updates on Art, Antiques, Collectibles as well as travel information for Buenos Aires, Argentina. Busco informacion sobre Fabricantes de carecorÃ­as para funerarias, Busco informacion sobre BONINO Y CIA. SA, SERVICIOS FUNEBRES, Top line is CARROCERIAS Middle line isVIVIAN Bottom line is Buenos Aires, enviar datos al admin@frassinetti.com o por Correo Argentina, Roberto Dario Frassinetti, Santa Fe 1389 Martinez, 1640, Buenos Aires, Argentina. Bob Frassinetti: For more information: Email: Bob Frassinetti. Press here to go back to web blog:Daily Updates on Art, Antiques, Collectibles as well as travel information for Buenos Aires, Argentina. Phone me thru Skype, ID: Bob Frassinetti or you can also chat with me thru Yahoo, press here: Yahoo Contact Find me on MySpace and be my friend! Made in England and Argentina! Siam Di Tella, was a trademark company in Argentina, and as such its products were cultural icons, so its a good choice for the Artdealer Car Rally Project. Email: Bob Frassinetti. Art and Antique Dealer & Journalist. So if you are interested in Art or Antiques, and you are travelling to Argentina please feel free to email us…….. and what about Collectibles and just to mention some like Advertising, Advertising Art, Architectural, Art Deco, Auto Parts, Badges, Banks, Beswick, Bottle, Bottle Openers, Bronze, Button, Calendars, Candy Containers, Carnival Glass, Chandeliers, Christmas, Coca Cola, Corkscrews, Elvis Presley, Ethnic Art, Ethnic Toys, Fans, Fishing, Fishing Reels, Folk Art, Francisco Adaro, Furniture, Lamps and lightning items, the wild 60's and 70's, Garden Furnishing, Girl Scout, Glass Art, Glass Contemporary, Golf, Halloween, Inkwells, Insulators, Ivory, Japanese Woodblock Prints, Jewellery, Judaic, Kitchen, Knife, Lamps, Lighters, Lightning Rod , Majolica, Match Holders, Medical, Motorcycles, Music, Napkin Rings, Nautical, Netsuke’s, Nutcrackers, Paintings, Liberato Spisso, born Buenos Aires, Argentina. 14 March 1903, Portrait Artist, Viski, Jean ( Janos ) 1891 - 1961, Old Car, Paper, Paperweights, Pens, Pencils, Pencil Sharpeners, Pepsi Cola, Perfume Bottles, Pewter, Phonographs, Photography, Postcards, Posters, Prints, Radio, Railroad , Records, Steam Tractor, Scientific Instruments, Sewing, Sheet Music, Silver, Souvenirs, Sports, Stero Cards, Stereoscopes, Telephones, Television, Tools, Toys, "The Buenos Aires Toy Museum. Argentina", or a Tractor, Typewriters, Watch, Weapons, Weather Vanes, Wood Carvings, Wooden, World's Fair, to say Vito Campanella. For more information: Email: Bob Frassinetti. Press here to go back to web blog:Daily Updates on Art, Antiques, Collectibles as well as travel information for Buenos Aires, Argentina. Phone me thru Skype, ID: Bob Frassinetti or you can also chat with me thru Yahoo, press here: Yahoo Contact Find me on MySpace and be my friend! For more information: Email: Bob Frassinetti. Press here to see Google Maps for the South of South America, on subjects like Art and Antique shops, Route 40, Travel Adventure, and other Travelling Rally Tours by Bob Frassinetti:Maps on Art, Antiques, Collectibles as well as travel information for Buenos Aires, Argentina, Chile and Uruguay. Bob Frassinetti. Copyright 2009 Roberto Dario Frassinetti.